Our Annual Service is a practical cost saving way for young families to manage all of their waste streams. 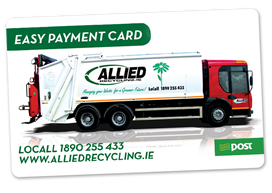 We provide two or three bin service depending on where you live. Each bin is emptied fortnightly ensuring all your bins always have capacity. There is a level monthly charge from only €25 for this service, so you know exactly what it costs. “Fair Use” terms apply, in line with current regulations. 600kgs of waste, 390kgs of compost. No limit on recyclables. Switch and save money on your account for only €25 per month. All three bins emptied every two weeks!